Hawaii Native Status: Introduced. 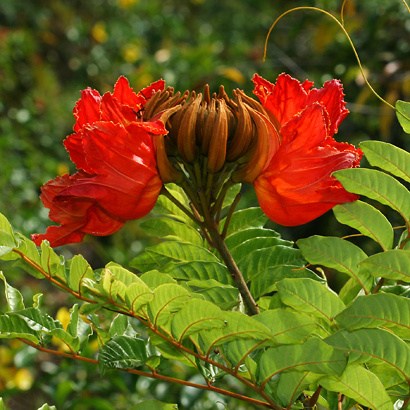 This naturalized ornamental flowering tree is native to tropical Africa. 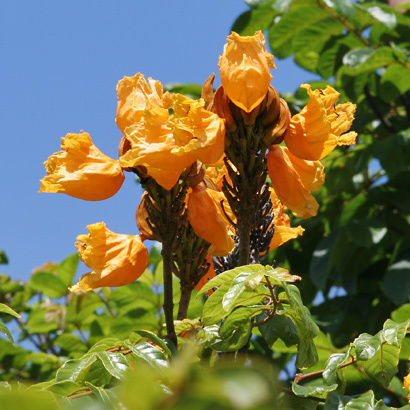 Description: The showy flowers are in erect racemes above the foliage at the top of the trees. The individual flowers are 4 inches (10 cm) long and have a curved, flattened, tulip-like shape and 5 ruffled, rounded to triangular, gold-edged lobes. The flower buds are brown, horn-shaped, and filled with water that will squirt out if the buds are squeezed. The flowers are followed by erect, brown, lance-shaped to boat-shaped, up to 10 inch (25 cm) long, woody seed capsules with papery, winged, wind-dispersed seeds. The leaves are glossy green and pinnately compound with an odd number of elliptic leaflets. The bark is light grayish brown and smooth to lightly fissured with age. The branches are dotted with conspicuous white lenticels (corky warts). The large trunks are buttressed at the base. 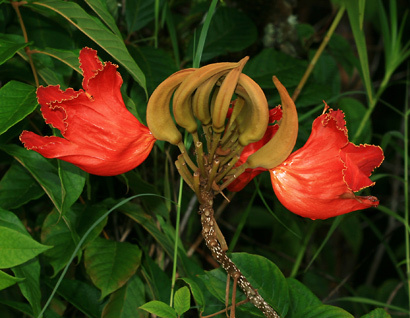 Here in Hawaii, African Tulip Tree grows in wet to mesic (moderately wet) areas at lower elevations. 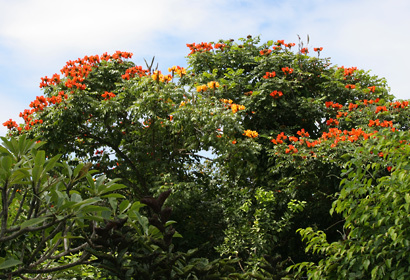 Because of its colorful flowers, this common, weedy tree is easy to spot amidst the other forest trees.